Analysis: Bridgewater considered a contract offer from the Dolphins, which would have included a chance to start in 2019. In the end, though, he's returning to the Saints and the potential to be Drew Brees' heir apparent. There's no telling how much tread Brees has left on his tires, but Bridgewater again will act as his primary backup. 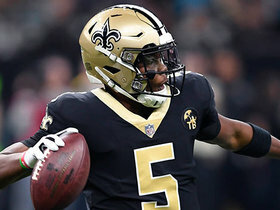 Bridgewater could renege on his commitment to re-sign with the Saints, as the quarterback is still weighing a contract offer from the Dolphins, Dianna Russini of ESPN reports. Analysis: Bridgewater may be having second thoughts about returning to New Orleans for another season with no chance of earning a starting job. 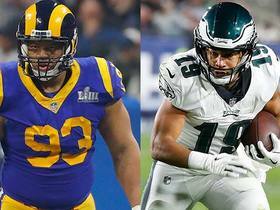 The Dolphins wouldn't be able to put much talent around Bridgewater, but they could at least promise a quarterback competition this summer. It's also quite possible the final decision simply comes down to money. Coach Sean Payton has dropped multiple hints that he views Bridgewater as the eventual replacement for Drew Brees. Bridgewater plans to re-sign with the Saints, Jane Slater of NFL Network reports. Bridgewater connected on 14 of 22 passes for 118 yards, a touchdown and an interception during Sunday's 33-14 loss to the Panthers. He added 12 yards on four carries. Analysis: Bridgewater hadn't completed a pass and had attempted just three in regular-season action since 2015, so some rust was expected. Still, it was a feel-good story to see him loft a nine-yard touchdown to Tre'Quan Smith early in the fourth quarter, with the game already well out of reach. The feel-goodery probably ends there. If all goes to plan for New Orleans, Sunday will have featured Bridgewater's last meaningful snaps of the season. Bridgewater will start Sunday's game against the Panthers, Josh Katzenstein of The New Orleans Times-Picayune reports. Analysis: Coach Sean Payton made the announcement Friday afternoon, confirming Drew Brees won't play again until the divisional round of the playoffs. 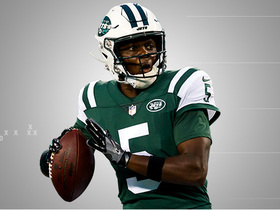 Making his first start since the end of the 2015 season, Bridgewater has an excellent opportunity to improve his value before his one-year contract expires. 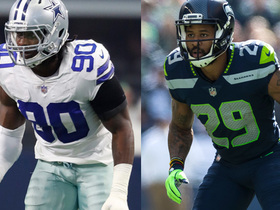 Of course, he'll probably spend much of the game playing with other backups, with Michael Thomas, Alvin Kamara and Mark Ingram unlikely to handle their usual workloads if they even play at all. 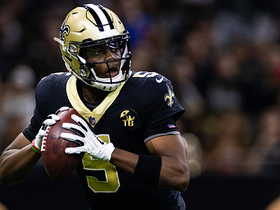 Bridgewater will likely see action on offense Sunday against the Panthers, as coach Sean Payton is expected to rest a number of key regulars with the Saints having clinched the NFC's top seed, Mike Triplett of ESPN.com reports. 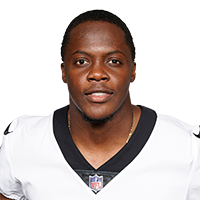 New Orleans Saints quarterback Teddy Bridgewater confirms on Twitter he will head back to the Saints after meeting with the Miami Dolphins earlier in the week. 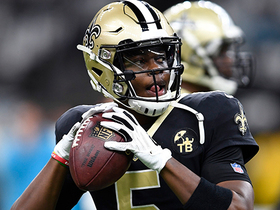 NFL Network's Charley Casserly discusses why he believes New Orleans Saints quarterback Teddy Bridgewater should re-sign with his current team instead of going to the Miami Dolphins. 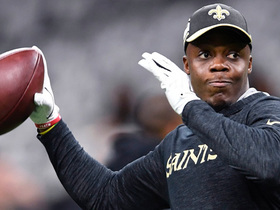 NFL Network Insider Ian Rapoport reports that quarterback Teddy Bridgewater's expected deal with the New Orleans Saints is 'not done yet' and that the Miami Dolphins are still pursuing signing him. 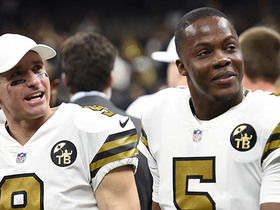 NFL Network's David Carr discusses New Orleans Saints quarterback Teddy Bridgewater remaining under head coach Sean Payton is the "right move" for him. 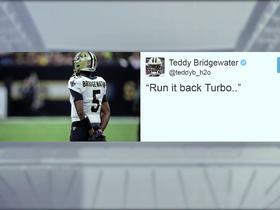 NFL Network's Jane Slater explains why quarterback Teddy Bridgewater decided to return to the New Orleans Saints. 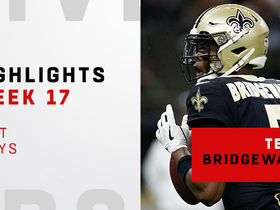 Check out preseason highlights of the recently traded New Orleans Saints quarterback Teddy Bridgewater.